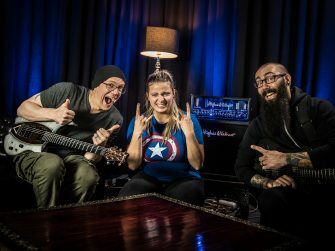 Devin Townsend Project visit H&K: new interviews! Devin Townsend and his guitar player, Dave Young, came to visit us at Hughes & Kettner headquarters a few weeks ago, and we have a bunch of cool interviews to share with you. Dave has played TubeMeister amps for years, and so he and Devin came over to Germany for a couple of days to play some music, drink some coffee and talk to us about anything and everything! There are five videos in all, and they will be revealed here as we publish them. The other videos are coming very soon, so keep checking back!